Civil wedding ceremonies are performed at the Paulding County Court by appointment. The ceremony is performed in the court building, usually in the courtroom. To schedule an appointment, please contact the clerk's office at (419) 399-5370. At least one party must be a Paulding County resident. Ohio residents must obtain a marriage license from the probate court in the county where one of you resides (Paulding County Probate Court may be reached at (419) 399-8256) prior to the scheduled marriage date. You will need to have the marriage license with you at the time of the ceremony. 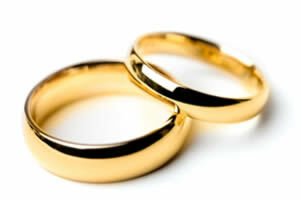 If neither party is a resident of Ohio, the marriage may be solemnized only in the county where the license is obtained. There is no charge for the service and no gratuities are accepted. Please dress appropriately. Witnesses are not required, but you are encouraged to bring anyone with whom you wish to share the event. Photographs are permitted and encouraged. The Rules of Court can be viewed online or downloaded to your computer. Please note: The Rules of Court are in PDF format and require the free Adobe Reader for viewing.